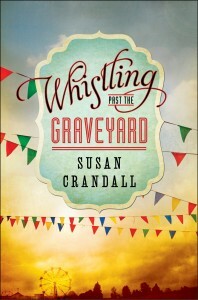 Whistling Past the Graveyard is headed toward its third hardcover printing at Gallery Books / Simon & Schuster! We’ve been looking for first editions, and have not been able to come up with any, so if you find one, snap it up! How can you tell if it’s a first edition? It’s easy. All first editions of Whistling Past the Graveyard are clearly marked “FIRST EDITION” on the publishing page (you know, the one with all the copyright stuff, library organizational information and that all publishing occurs in New York) that we never read because the narrative is really bad. For some reason not all books are marked in a similar fashion. Nobody seems to know why. But you can also identify a first edition of Whistling from ten feet away. How? Look for the teal paper under the dust jacket. Gallery Books was so excited about the release that they spent extra on some really nice teal paper that blends in well with the jacket artwork. They haven’t been able to get any more in time for the reprints, so the second editions are tan and we’re soon to find out what color the third editions will be.